In this guide I’m going to show you the quickest, easiest and most efficient way to access websites blocked because of GDPR. If you haven’t yet heard of GDPR than I would question where you’ve been for the last two weeks. If you’re like me and millions of others your mailbox will have been getting crammed daily full of emails asking you to continue to opt into their marketing. If you’re also like me you’ve gotten so tired of them that you’ve just started deleting them without even choosing an Opt In or Opt Out choice. Annoyances aside, there is a serious consequence to GDPR and that is that many websites that are outside the EU have decided rather than comply with the regulations they would rather just block EU visitors, either temporarily or permanently. 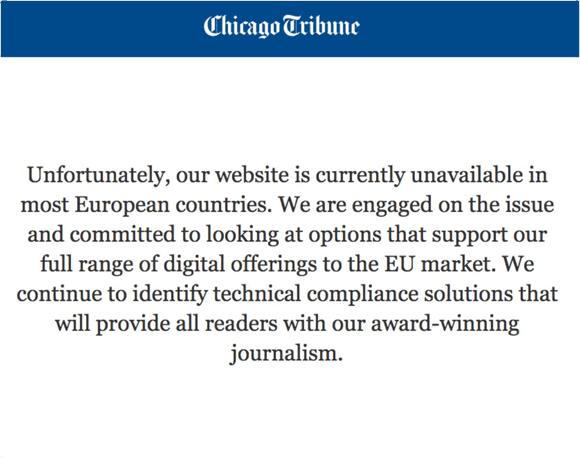 Everything from the Los Angeles Times, Chicago Tribune and Orlando Sentinel to Instapaper have chosen to block the entire EU population. If you’re an EU resident then this can be a huge headache but thankfully it’s really easy to bypass these restrictions and unblock any website that’s blocking you because of GDPR. The first thing to understand is the websites blocking you from accessing them have not been required to under any regulations. They have instead opted to block you because complying with the regulations is either too difficult for them or they decided that complying with them would affect their business model too much. It is extremely easy to bypass these blocks and all you’ll need is a little app called a VPN. A VPN is an app that is available for almost all types of devices from computers to phones and tablets to TV media sticks. A VPN allows you to disguise your real location so if you’re currently in the EU but want to access a website in America for example then you can pretend you are in America and skip past the blockade. Just one of the many GDPR blocked websites. 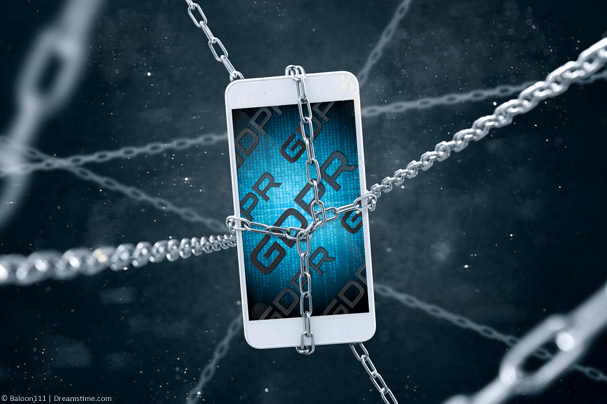 VPN apps cost just a couple of pounds or euro per month and are nearly always charged in US Dollars. You can expect to pay between $5 – $10 depending on how long you subscribe for. First you’ll need to choose a VPN provider from the following three, I recommend IPVanish because they’re ever so slightly more reliable than the rest but the choice is yours. Once you’ve chosen a provider from the three above follow the steps below. Visit your chosen VPN provider, for example IPVanish and sign-up for their service. The longer you subscribe the better deal you will get. Once you’ve signed up visit the section of the website to download their app, on the IPVanish website you can find that under ‘Apps‘. Select and download the correct app for your type of device and install it. Open the app and when required to, login. 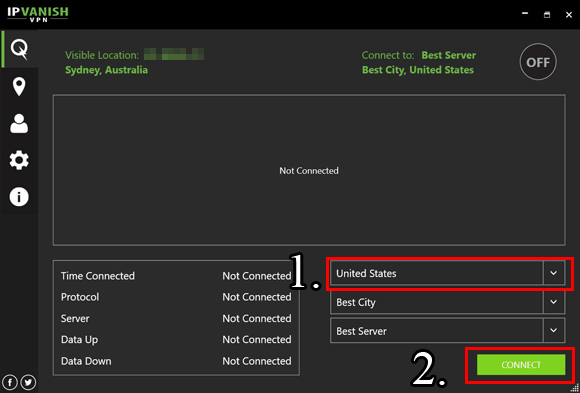 From the selection of countries choose United States and then press Connect. It won’t take more than 15 seconds for the app to get connected. Now when you visit any website it will think you’re in the United States rather than the EU and so won’t block you. You’re now free to access any website that has decided to block EU residents because of GDPR regulations. GDPR has been introduced to protect your privacy and as an EU citizen you should appreciate that lawmakers are trying to ensure that companies play fair. However, GDPR is not perfect and some have found flaws in the system saying it has gone too far. Regardless of what you think of GDPR, the truth is it is hindering your access to some websites. However, it should be noted that these websites have chosen to block you from accessing and have not been required to block you. They have in main chosen to block you because their website does not comply with GDPR regulations and rather than face a hefty fine of up to €20 million of 4% of their annual turnover they have decided it is safer to block all EU residents. That said, it means that the website you’re unblocking is not complying with the new regulations and so your data could be at risk of being used in ways which the GDPR aims to stop. On a positive note a VPN service will protect your privacy more so than any such regulations and if you don’t enter any personal details into the website it is unable to abuse your privacy. If you are happy to enter any required details then your data will be handled in a manner related to the country it is registered in and not using GDPR regulations. Some websites, especially in the United States, have opted to block all EU residents from accessing them. This is not a requirement but a self-imposed choice so they don’t fall foul of new GDPR regulations. You can access these websites even in the EU by altering your online location. To do this you’ll need to sign up for a VPN app. 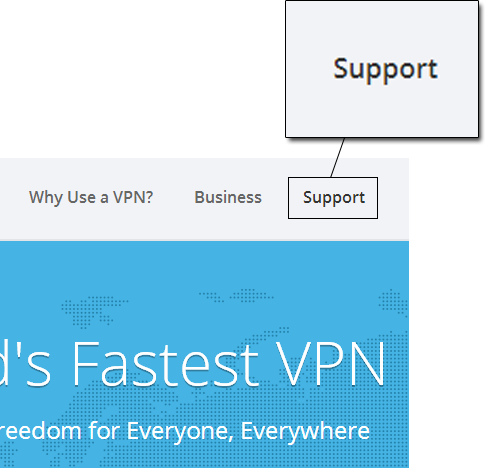 There are 100’s out there and many are listed in our VPN Comparison Guide. I recommend using IPVanish though which you can get by clicking the button below. They’ve got apps for all major devices, they’re easy to use and they have a 7-day money back giving you plenty of time to test their app risk-free. Once you’ve got their VPN app and installed it, connect to the United States and then you’ll be able to access any website which has blocked you because of GDPR and your location. What other sites have you found that have been blocked because of GDPR? I would love to hear what blocks you have been bypassing so why not let me and others know in the comments below.